From the seventeenth century until the middle of the nineteenth century the administrative divisions within Ireland were Townland, Parish, Barony, County and Province. The civil parish of Ballynascreen lay within the Barony of Loughinsholin in the new county of Londondonderry which was created in 1613. This map shows both the location of the townlands within the parish of Ballynascreen and the landlord of each townland. Townlands indicated in red were part of the Drapers' Estate, those in blue the Skinners' Estate and those in green the Stevenson Estate in Sixtowns. 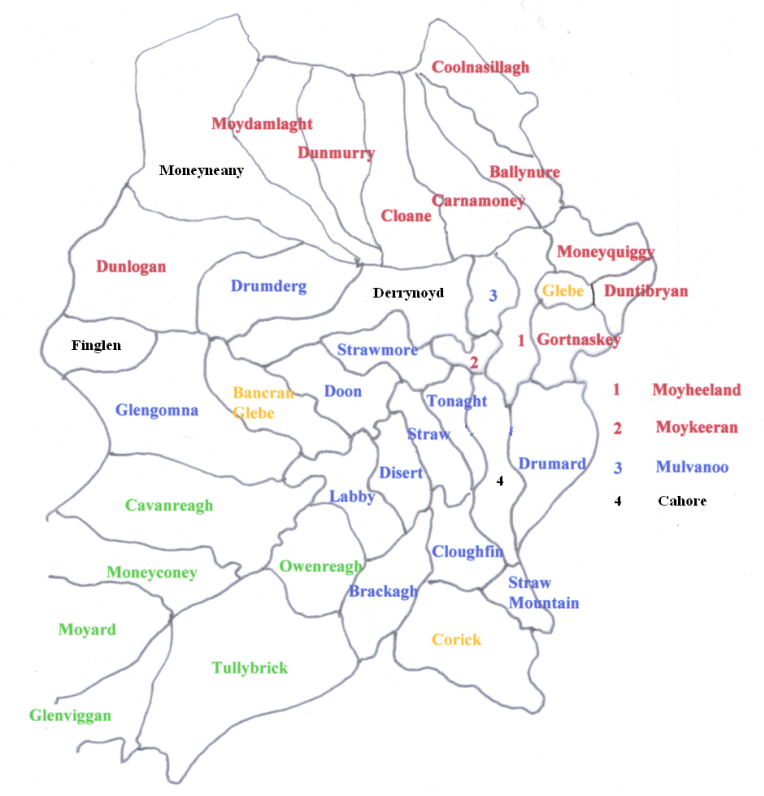 The townlands of Glebe, Bancran Glebe and Corick were churchlands. The townlands indicated in black were freeholds on the Skinners' estate. Derrynoyd, Moneyneany and Finglen* were on the estate of the Rev. Robert Torrens in 1859. The townland of Cahore [which contains Patrick Street, Draperstown] was owned by a number of individuals, including Hugh Lane and James Henry, in 1859. * I am not sure about Finglen. Originally, it may have been part of the Drapers' estate.